Mila Kunis’ engagement ring from Ashton Kutcher made its way onto her finger just about two years after the celebrity couple started dating. The massive diamond sparkler is a classic design – a solitaire round cut diamond set in platinum with semi-pave inlaid diamonds along the band. The main stone weighs in at just about five carats. Like Mila Kunis’ engagement ring, this beautiful solitaire from Brilliance features a slender band that magnifies the diamond and has a delicate, feminine appearance. The side diamonds add a glamorous touch and increases the overall sparkle of the ring’s design, no matter what size the center stone. Born August 14th of 1983 in Ukraine, Milena “Mila” Markovna Kunis moved to Los Angeles, California, at the age of seven, along with her family. The precocious Mila was discovered by an agent shortly after being enrolled in after-school acting classes. As a young girl, she appeared in numerous commercials and several television shows. She landed her first major role before her fifteenth birthday, playing the part of Jackie Burkhart on the popular TV series That 70’s Show. In September of 1999, she started voicing the part of Meg Griffin on the animated series Family Guy. Mila got her breakout film role in 2008, playing the part of Rachel Jansen in the romantic comedy Forgetting Sarah Marshall. Subsequent movie parts included the role of Mona Sax in 2008’s Max Payne Solara in 2010’s The Book of Eli, Jamie in 2011’s romantic comedy Friends with Benefits, Lori in 2012’s Ted, and Theodora, the Wicked Witch of the West, in 2013’s Oz the Great and Powerful. Her performance as Lily in 2010’s psychological horror film Black Swan won her the Premio Marcello Mastroianni award for Best Young Actor or Actress at the 67th Venice International Film Festival, along with a Screen Actors Guild Award for Outstanding Performance by a Female Actor in a Supporting Role. She also received a nomination for a Golden Globe Award for Best Supporting Actress for the part. Did you know that Mila Kunis’ very first audition landed her a role in a Barbie Commercial? This was just one of the many small parts she played as a very busy, hardworking child star. Others included roles on the popular daytime series Days of Our Lives and prime-time show Baywatch. She had a minor role in the show 7th Heaven, and a supporting role in the movie Honey, We Shrunk Ourselves. GQ has named Mila Kunis one of the “100 Hottest Women of All Time,” and between film and TV roles, she has enjoyed a number of modeling jobs, often donating the proceeds to charities including the Chrysalis Foundation and the NYC AIDS Foundation. Mila announced her pregnancy after becoming engaged to Ashton Kutcher, and gave birth to their daughter, Wyatt Isabelle, on October 1 of 2014. She and Ashton have yet to set a wedding date, but the two frequently appear together with their daughter, smiling, laughing, and enjoying family life. What Our Experts Have to Say about Mila Kunis’s Engagement Ring. Mila Kunis’ engagement ring is inspired by love, as are all engagement rings. Not at all ostentatious, and intended to complement her style without detracting from her graceful beauty, the solitaire engagement ring she wears has a timeless look that will never go out of style. 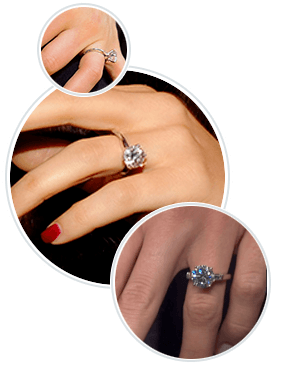 It’s one of those rare celebrity engagement rings that everyday people can easily take inspiration from while sticking to a budget. Hollywood-worthy bling is almost always expensive, but when compared with some of the dazzlers we’ve featured, Mila Kunis’ engagement ring is quite demure. Experts estimate its cost at just over $260,000 – not a pittance, but well below the million-dollar mark. Whether you’d like an exact replica of Mila’s engagement ring or if you’d simply like to use it as inspiration for a design of your own, you can use the simple online tools at Brilliance to create a look that’s just as beautiful while making a unique style statement that’s 100 percent you. Let the diamond experts at Brilliance help you to create the perfect look to represent your love while bringing beauty and sparkle into your life.